Through this program members of our congregation visit other members who may be shut in or are otherwise restricted in their ability to get out. The purpose of these regular visits is to share the care of the congregation for those being visited. Requests for visits or to volunteer to be a One Anothering Visitor should go to Jane Summey Mullennix. Basketball Banquet - March 10, 2019, 5 p.m. The aim of the DeaconCare Program is to: Connect people to God, in worship, fellowship, and service, Connect people to each other in the life of the congregation and its mission in the world. By connecting we offer, share and receive God's care and participate in the work to which God has called us. (Sept.-May) Sept. 4, Oct. 2, Nov. 6, Dec. 4, 2018; Jan. 8, Feb. 5, March 5, April 2, May 7, 2019 Luncheon & Programs -- click here for listing. 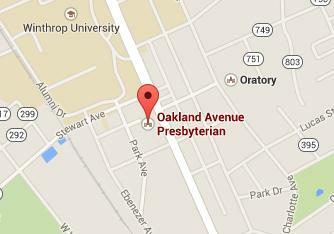 11:45 a.m.-1:00 p.m., Fellowship Hall Cost $6/person at the OAPC Welcome Center Community welcome! No reservation required. Calling all Inactive Stephen Ministers If you have served as a Stephen Minister in the past and think you might be interested in serving again, the Stephen Ministry Program at OAPC would love to have you back! Please consider your call and take a moment to decide whether or not you would like to enter back into an active caring relationship. Contact Jo Grier, 803-328-1326, if you are interested in serving or if you have any questions.